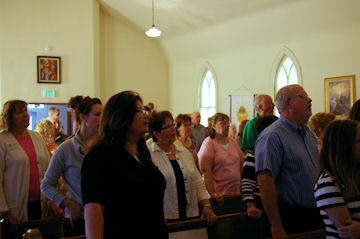 As a United Methodist congregation, we believe in God the Father, Jesus;God's only begotten Son and the Holy Spirit. We believe that God is the creator of all things and we believe that Jesus died for the sins of the world, rose again on the third day and is seated at the right hand of God the Father. We believe in the love of God and that He desires that all people come to the full knowledge of His unconditional and unending love. We believe that God's grace is available to each of us and nothing we do makes God love us any more or any less. We believe that we are all in need of God's grace and He gives us His grace freely because of the great price that Jesus paid for us. Because of our Lord's sacrifice, God welcomes all at the communion table who worship with us.